Daily Illuminator: Neeeed Mooooore Zombieeeeez! October 10, 2010: Neeeed Mooooore Zombieeeeez! 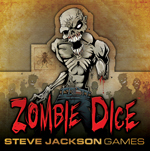 As followers of our Twitter feed have heard, we're out of Zombie Dice. Well, our warehouse is out (the actual warehouse, that is. Our retail arm, Warehouse 23, still has a pallet-load! ), but all the copies have gone to distributors. This means your friendly local game store still has plenty of time to stock up for the holidays. The second printing has already been ordered, and will arrive before the end of the year. We're hoping the supplies in the distributors' warehouses hold out that long, so no one will notice our slight shortage. Of course, if the worst does occur, and your favorite game store is temporarily out of stock, there's always the iPhone version (in both free and paid versions) and the Flash demo to get you through.